We call Chris Mr. Needy because he always needs to be touching someone. Some cats need to be an only cat but Chris could never survive without company. This entry was posted in Uncategorized and tagged Cats, cute, ginger, gold, needy on November 30, 2018 by Charles Huss. I posted this almost two years ago to show how needy Chris could get. I was reminded of that at 4:30 this morning when Rose got up to use the bathroom and Chris and Puck ran into the bedroom. She didn’t have the energy to throw them out so she let them stay. Puck was good and lied on my nightstand but Chris would not stop annoying me with his biting, licking, scratching and whatever else he could think of. I put up with him for fifteen minutes and then I was forced to get up. He is now napping on my lap as I write this. Sorry but you may have to click through to the original to see the video. Chris was being extra needy this morning and since I had my camera nearby, I thought I would video him for you. Enjoy. This entry was posted in Uncategorized and tagged cute, needy on March 10, 2016 by Charles Huss. 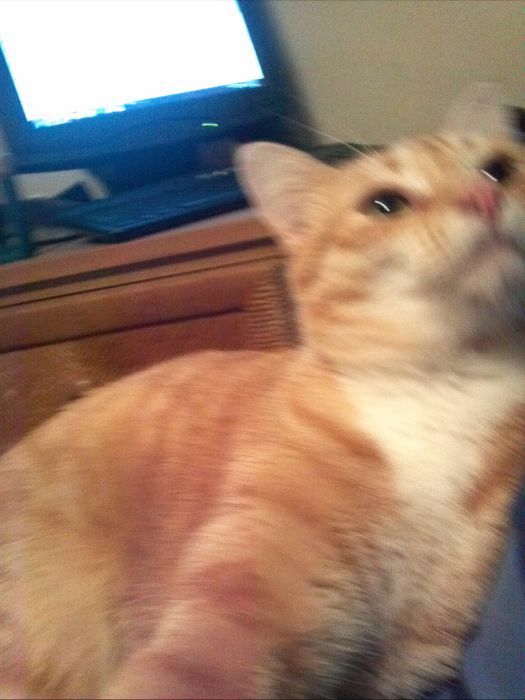 This entry was posted in Uncategorized and tagged cat, cute, funny, needy, Video on July 30, 2013 by Charles Huss. Chris is making it hard for me to brush my teeth. Lately, it seems like everywhere I go, there is a cat wanting to get on my shoulders. If I go into the kitchen or bathroom, Chris is right there on the counter next to me. Sometimes he just jumps up and sometimes he stands on his hind legs with his paws on my shoulders and cries for me to help him up. I then have to crouch down, put my arm around his legs and stand back up again. For some reason, he especially likes to be up there while I am brushing my teeth. That is not good for him because as soon as I am done and have to rinse, he is S.O.L. He also has developed a certain pattern where he will climb on my shoulders from my right and then have to turn around because he likes to lie with his head on my right. At first I thought he had OCD but then I realized that my wife and I sleep on the same side of the bed every night so I guess it’s common. Chris has climbed on my shoulders since the day we met but lately it seems more like he has a special need to do it. I suppose it is only temporary though. Next month, I am sure, he will have a new, weird thing that he will be doing. If anyone has a cat that does this, please leave a comment. I’d love to hear about it. 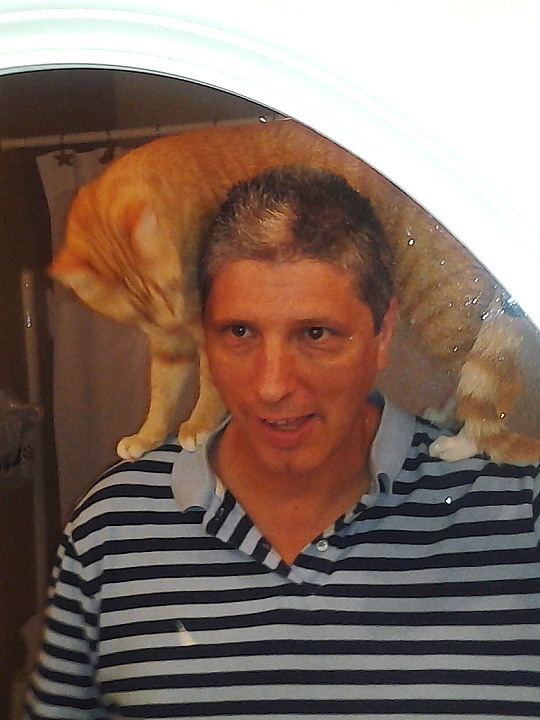 This entry was posted in Uncategorized and tagged cat, habit, needy, shoulders on July 24, 2013 by Charles Huss. This is the story of Bad Cat Chris. The name implies that this cat is bad so if I would say to you that Chris had been bad lately, you would probably say, “Duh!” From your point of view, you would be right to say that but when you live with a bad cat every day you tend to become immune to the behavior. So, the fact that I think Chris has been bad lately must mean that he has been really bad. Perhaps Tigger’s death has affected him, I don’t know, but he seems like he doesn’t know what to do with himself lately. It is like he is a kitten again with all this built up energy. My wife and I like to read at night but lately he has been going back and forth between us, first interfering with her book and then, two minutes later, interfering with what I am reading. This continues back and forth until Rose gets angry and throws him down. This slows him down but soon he picks up where he left off. Of course, getting in the way is not enough. he has to also bite. For some reason, Rose is immune to most of the biting but I am not. If he is not biting my nose, he is biting my knee, ankle, shoulder or whatever else he can bite that will annoy me. He doesn’t always do this but sometimes he just gets in a biting mood. Those moods seem to be quite frequent lately. I have been working on this post in the evening using my tablet computer that has an attachable keyboard. I sit on the bed and write while Rose sits on her chair and reads. When it is my turn to be bothered, Chris goes out of his way to step on the keys. This is my second evening trying to write and I think I will have to finish this post tomorrow on the desktop computer, even though Chris bothers me there too. Below is a Simon’s Cat video that does a great job explaining what I go through. Chris also seems to spend more time getting into cabinets lately. He has become a pro at opening the doors and climbing inside but the doors shut behind him and he is not as good getting out as he is getting in. Often we hear the familiar bang…bang…bang. It’s Chris in the cabinet pushing the door open. Usually he has to step over a bunch of stuff to get in, but then he is behind all that stuff and he can’t get the leverage needed to open the door, so I have to find the cabinet he is in and let him out. He has figured out where we keep the catnip. Until Rose moved it the other day, it was on the top shelf, above where we keep our spices. The video below shows Chris getting to the top of the cabinet above the catnip but it does not show him opening the door from above and reaching in it. A couple of days ago he was actually able to pull it out of the cabinet. That is what prompted Rose to put it in the storage closet. We thought getting Puck would be good for Chris because he would finally have another cat that was willing to play with him. While that has been true, since Tigger is no longer with us, he now has nobody willing to nap with him and perhaps he needs more physical contact. I don’t have the answers but I hope we figure something out soon before he drives us crazy. 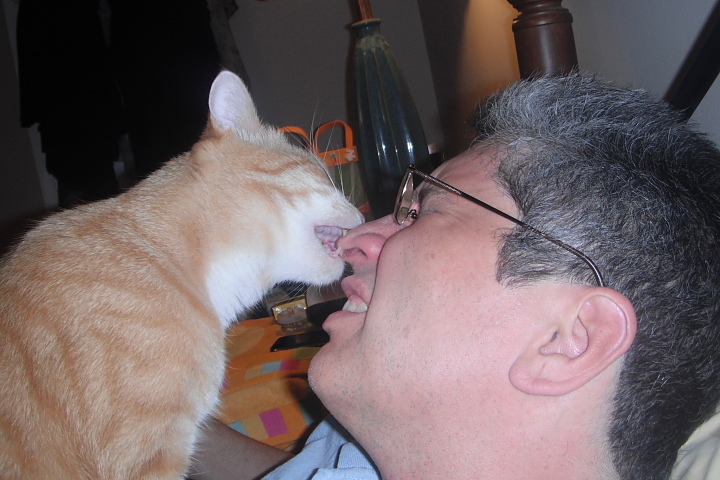 This entry was posted in Uncategorized and tagged A.D.D., Bad Cat, behavior problem, needy on March 28, 2013 by Charles Huss. As I write this, Chris is napping on my lap. Oops… I disturbed him reaching for my phone to photograph him. I was able to get one bad picture before he disappeared. There is a point to mentioning this. Chris has sought more attention from Rose and I since Tigger passed away. That is not to say he didn’t want attention before, it just seems like he has become even more needy lately. Chris has always sought attention from other cats and received it. Usually he would lie down on top of or between two other cats, who would at first be annoyed with him but then would settle into washing his ears or something. This happened often with Tigger and Abbey who would be sleeping together and then would be suddenly awakened by Mr. Rudeness himself. Now, all the cats we introduced Chris to three and a half years ago are gone. Tigger, Abbey, Alex and Flash have all passed away. We now have only Chris and our newest cat, Puck. The problem is, while Puck is a good cat, he prefers to sleep alone. He will play (fight) with Chris, which the other cats wouldn’t do, but he won’t sleep with him, so Chris has turned his attention to us when nap time comes around, which, for Chris, is not very often. We feel bad for him and have even considered getting another cat but there are many problems with that idea. Someday we want to live in a motorhome and/or a boat and travel a bit. When that happens, we won’t have room for more than two cats. Even before that happens we may rent a small place near the beach and the same reasoning will apply. Also, we have no way to be sure the new cat will even like Chris. Judging from experience, that would probably be no. Yesterday, Chris climbed to the top of the of the cat perch and lied on top of Puck and started washing his ears. This went on for a minute or two and Rose and I were hopeful that this would be their first nap together, but Puck then got up and left the perch, leaving Chris there by himself. So sad. Perhaps as Puck matures a little more, things will change. We can only hope. This entry was posted in Uncategorized and tagged attention, Bad Cat Chris, needy, sleep together on March 17, 2013 by Charles Huss.